With the winter chills finally subsiding and warm weather right around the corner, it’s time to splash into summer. And there’s nothing that says summer better than a bbq with friends and family. With every great bbq, there’s a spread of tasty food! To really surprise your guests and spice things up this bbq season, try incorporating a single theme in all your dishes. Today’s special ingredient? Pecans! 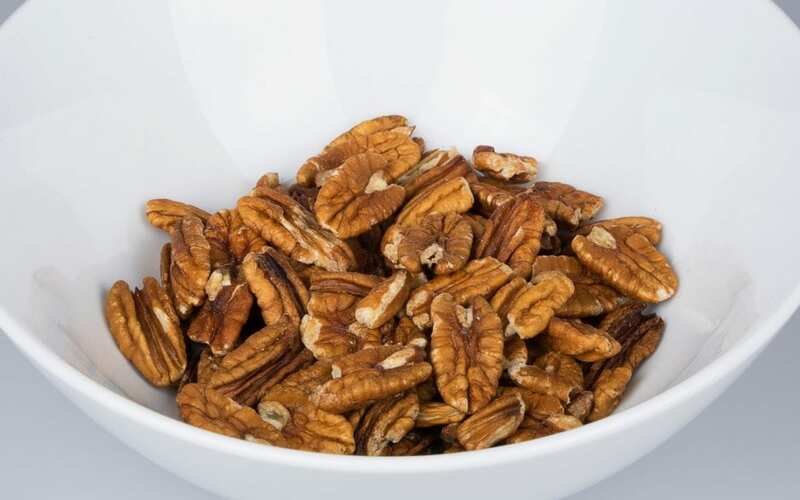 Pecans are a powerhouse nut that’s packed with vitamins and minerals, while offering a wealth of health benefits. Not to mention, they taste great, too! From appetizers to desserts, pecans can be incorporated in any dish–providing diverse flavors and a touch of texture. We know what you’re thinking: pecans at a bbq? Certainly not something that first comes to mind when you think of summertime BBQs. However, after tasting these dishes, your guests will be begging for the recipes! Pecan Cheese Truffles: This fun appetizer is easy to eat and even easier to make! The best part? It doesn’t need to be cooked! Simply select your favorite soft cheeses, fresh herbs, pecans, and maybe even some bacon, and start rolling! With the robustness of cheese and the delightful crunch of pecans, your guest will swoon over this bite-sized appetizer. Find the recipe here! Sweet and Spicy Nut Mix: Reminiscent of Chex Mix, this Sweet and Spicy Nut Mix is sure to be a hit at your next bbq. Featuring pretzels, rice cereal squares, pecans, almonds, and a selecting of spices, this yummy appetizer is great for all occasions. Click here for the recipe. Green Bean Salad with Fennel and Toasted Pecan Dukkah: This green bean salad is the perfect side dish for any bbq meal. Although it sounds fancy, this side dish is very simple to make; a dukkah is simply a nut and spice blend! Tasty, zesty, and crisp, this side dish will have your taste buds soaring! Find the recipe here. Chocolate Pecan Sheet Pie: This delectable dessert is sure to end the night on a sweet note. This dessert features a balance of sweet and bitter from the molasses, pecan pie filling, and creamy chocolate ganache. Any sweet tooth is sure to fall in love with this rich dessert. Click here for the recipe. Maple Glazed Pork Chops with Toasted Pecans: Nothing says ‘bbq’ better than grilling some delicious pork chops! This recipe requires you to bake them in the oven, however, for a crispy crust, don’t be afraid to throw them on the grill for a few minutes. Find the recipe here. With these dishes featured at your summertime bbq, you’ll be sure to impress your guests and have them leave with full bellies. For high-quality pecans that complement any dish, make sure to visit your local wholesale pecan tree nursery for the best deals on pecan trees! Georgia Pecan Nursery is a licensed live plant pecan tree nursery with container and bareroot pecan trees for sale. To learn more about our pecan trees for sale, contact Georgia Pecan Nursery, today!